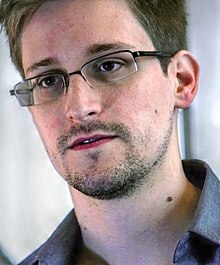 Edward Joseph Snowden (born June 21, 1983) is an American former technical contractor for the United States National Security Agency (NSA) and a former employee of the Central Intelligence Agency (CIA) who leaked details of several top-secret U.S. and British government mass surveillance programs to the press. His disclosures revealed numerous global surveillance programs, many run by the NSA and the Five Eyes Intelligence Alliance with the cooperation of telecommunication companies and European governments. Snowden came to international attention after stories based on the material appeared in The Guardian and The Washington Post. Further disclosures were made by other publications including Der Spiegel and The New York Times. The NSA has built an infrastructure that allows it to intercept almost everything. With this capability, the vast majority of human communications are automatically ingested without targeting. If I wanted to see your emails or your wife's phone, all I have to do is use intercepts. I can get your emails, passwords, phone records, credit cards. I don't want to live in a society that does these sort of things... I do not want to live in a world where everything I do and say is recorded. That is not something I am willing to support or live under. Edward Snowden, NSA files source: 'If they want to get you, in time they will', The Guardian, 10 June 2013. You can't come up against the world's most powerful intelligence agencies and not accept the risk. If they want to get you, over time they will. Politics: the art of convincing decent people to forget the lesser of two evils is also evil. Edward Snowden Q and A: NSA whistleblower answers your questions (video), published by The Guardian on 17 June 2013. I did not reveal any US operations against legitimate military targets. I pointed out where the NSA has hacked civilian infrastructure such as universities, hospitals, and private businesses because it is dangerous. All I can say right now is the US Government is not going to be able to cover this up by jailing or murdering me. Truth is coming, and it cannot be stopped. If I were a Chinese spy, why wouldn't I have flown directly into Beijing? I could be living in a palace petting a phoenix by now. Seeing someone in the position of James Clapper - the Director of National Intelligence - baldly lying to the public without repercussion is the evidence of a subverted democracy. The consent of the governed is not consent if it is not informed. Unfortunately, the mainstream media now seems far more interested in what I said when I was 17 or what my girlfriend looks like rather than, say, the largest program of suspicionless surveillance in human history. Bathtub falls and police officers kill more Americans than terrorism, yet we've been asked to sacrifice our most sacred rights for fear of falling victim to it. I don't want to live in a world where everything that I say, everything I do, everyone I talk to, every expression of creativity or love or friendship is recorded. Edward Snowden: 'The US government will say I aided our enemies' – video interview, published by The Guardian on 8 July 2013. The government and intelligence services of the United States of America have attempted to make an example of me, a warning to all others who might speak out as I have. I have been made stateless and hounded for my act of political expression. Edward Snowden accuses US of illegal, aggressive campaign in his first appearance in the airport, published by The Guardian 12 July 2013. The true measurement of a person's worth isn't what they say they believe in, but what they do in defense of those beliefs. If you're not acting on your beliefs, then they probably aren't real. Penguin Books 2015 edition ISBN 978-0-241-97289-2, page 45. It is we who infuse life with meaning through our actions and the stories we create with them. Penguin Books 2015 edition, page 45. And history also shows that seemingly ordinary people who are sufficiently resolute about justice can triumph over the most formidable adversaries. Hi and Merry Christmas. I’m honored to have a chance to speak with you and your family this year. Recently we learned that our governments, working in concert, have created a system of worldwide system of mass surveillance watching everything we do. Great Britain’s George Orwell warned us of the danger of this kind of information. The types of collection in the book -– microphones and video cameras, TVs that watch us –- are nothing compared to what we have available today. We have sensors in our pockets that track us everywhere we go. Think about what this means for the privacy of the average person. A child born today will grow up with no conception of privacy at all. They’ll never know what it means to have a private moment to themselves an unrecorded, unanalyzed thought. And that’s a problem because privacy matters; privacy is what allows us to determine who we are and who we want to be. The conversation occurring today will determine the amount of trust we can place both in the technology that surrounds us and the government that regulates it. Together we can find a better balance, end mass surveillance, and remind the government that if it really wants to know how we feel, asking is always cheaper than spying. I don’t work with people. I don’t recruit agents. What I do is I put systems to work for the United States. And I’ve done that at all levels from — from the bottom on the ground all the way to the top. Saying that you don’t care about the right to privacy because you have nothing to hide is no different than saying you don’t care about freedom of speech because you have nothing to say. It’s a deeply anti social principle because rights are not just individual, they’re collective, and what may not have value to you today may have value to an entire population, an entire people, an entire way of life tomorrow. And if you don’t stand up for it, then who will? Abandoning open society for fear of terrorism is the only way to be defeated by it. Privacy is the right to a free mind. Snowden, Chomsky, and Greenwald discuss privacy, on 35:21. [Snowden] betrayed the trust and confidence we had in him. This was an individual with top secret clearance whose duty it was to administer these networks. He betrayed that confidence and stole some of our secrets. Keith B. Alexander, NSA General Keith Alexander: 'Snowden betrayed us', BBC News, 23 June 2013. I think I have just read about the man for which I have waited. Earmarks of a real hero. Glenn Beck, Twitter post, 9 June 2013. He's obviously violated the laws of America, for which he's responsible, but I think the invasion of human rights and American privacy has gone too far … I think that the secrecy that has been surrounding this invasion of privacy has been excessive, so I think that the bringing of it to the public notice has probably been, in the long term, beneficial. Jimmy Carter, "Father proposes deal for Snowden's voluntary return", CNN, 30 June 2013. Snowden did what he did because he recognised the NSA's surveillance programs for what they are: dangerous, unconstitutional activity. This wholesale invasion of Americans' and foreign citizens' privacy does not contribute to our security; it puts in danger the very liberties we're trying to protect. Daniel Ellsberg, "Edward Snowden: saving us from the United Stasi of America", The Guardian, 10 June 2013. He's a fugitive, not as Secretary Kerry says from justice — he's a fugitive from injustice. He has no chance of a fair, just trial in this country. [Snowden] has joined the ranks of the hunted and the persecuted because he named and documented the crimes of the state. His defiance of the control and monitoring of our lives by the security and surveillance makes him an American hero. Chris Hedges, "New Yorkers Declare “I Stand With Edward Snowden”: Dozens Rally & Draw Positive Media Attention for NSA Whistleblower", The Sparrow Project, 10 June 2013. Chris Hedges, “Our Only Hope Will Come Through Rebellion” (2014), 25:13. Moral courage ... is always defined by the state as treason. ... It is the courage to act and speak the truth. Thompson had it. Daniel Ellsberg had it. Malcolm X had it. Martin Luther King had it. What those in authority once said about them they say today about Snowden. Chris Hedges, “Our Only Hope Will Come Through Rebellion” (2014), 27:43. As head of state and government of the Bolivarian Republic of Venezuela I have decided to offer humanitarian asylum to the young US citizen Edward Snowden so he can come to the fatherland of Bolivar and Chavez to live away from the imperial North American persecution. Nicolás Maduro, "Bolivia, Venezuela and Nicaragua offer Snowden asylum", BBC News, 6 July 2013. I'm not going to be scrambling jets to get a 29-year-old hacker. Barack Obama, US not 'scrambling jets' to get 'hacker', Fox News, June 27 2013. We are open, respectful of the right to asylum, and it is clear that if circumstances permit it, we would receive Snowden with pleasure and give him asylum here in Nicaragua. Daniel Ortega, "Bolivia, Venezuela and Nicaragua offer Snowden asylum", BBC News, 6 July 2013. [Snowden]'s done a great service, because he's telling the truth and this is what we are starved for. The American people are starved for the truth. And when you have a dictatorship or an authoritarian government, truth becomes treasonous. For somebody to tell the American people the truth is a heroic effort. Ron Paul, "For somebody to tell the American people the truth is a heroic effort...he knows it's risky", Piers Morgan - CNN, 10 June 2013. To me Snowden is a hero because he revealed secrets that we should all know, that the United States has repeatedly violated the fourth amendment. He should be welcomed and offered asylum. But he has no place to hide because every country is intimidated by the United States. Oliver Stone, "Oliver Stone defends Edward Snowden over NSA revelations", The Guardian, 5 July 2013.